Iran’s presidential elections, slated for mid-June, will take place against a background of domestic uncertainty. The economy has been battered by sanctions from abroad and mismanagement at home. Oil sales and foreign exchange earnings have plummeted, while inflation has soared. Industries are flagging. And banks face a looming crisis. On foreign policy, there is no resolution in sight to the stand-off between Tehran and the P5+1—the five members of the U.N. Security Council plus Germany—over Iran’s nuclear program. The ruling elite is riven by factions, and no leader seems to have a clear idea about how to extract Iran from its current predicaments. And the urban middle class, burned by what many consider rigged presidential elections in 2009, is increasingly uninterested in voting. The election is still five months away, but a flurry of speculation has already begun about possible candidates. Presidential wannabes come from three broad groups: First, conservatives aligned with Supreme Leader Ayatollah Ali Khamenei. Second, populists around President Mahmoud Ahmadinejad. And third, reformists, two of whose leaders have been under house arrest for almost two years. · and Ali Akbar Velayati, Khamenei’s principal foreign policy adviser. All three are close to Khamenei, have shown little independence in the past, and are likely to follow Khamenei’s lead. 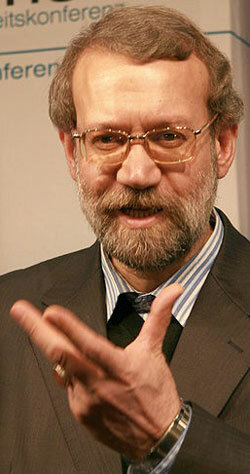 Larijani is especially well-connected. His brother is the hard-line chief of the judiciary. He has served in cabinet posts and as head of national broadcasting. Khamenei has used him for sensitive foreign policy assignments in the past. But he won less than six per cent of the vote when he ran for president in 2005. Mohammad-Baqer Qalibaf, a former Revolutionary Guards commander, is also on many lists of potential candidates. He is well-regarded as the current mayor of Tehran, but he does not seem to resonate with voters. He garnered less than 14 per cent of the vote in the 2005 presidential ballot against Ahmadinejad and other candidates. Three other possible conservative candidates are men with national security or nuclear energy experience. · Hassan Rouhani, a former head of the NSC and lead nuclear negotiator. He has indicated a desire to run, based on his ability to address Iran’s foreign policy problems. · Saeed Jalili, the current head of the NSC and principal nuclear negotiator with the world’s six major powers, or P5+1. Several websites are promoting his candidacy. · Foreign minister Ali Akbar Salehi, a U.S.-educated physicist who once ran Iran’s nuclear agency and was Iran’s representative to the International Atomic Energy Agency, may also run. These men are principally technocrats. Lacking a political base of their own, they too would be beholden to the Supreme Leader. But they could present themselves as competent problem solvers— candidates with the foreign policy experience to resolve outstanding issues with the United States and the Europeans. Other possible conservative candidates, such as former Guards commander Mohsen Rezai, are long-shots. There are hints about attempts to coalesce conservatives around one candidate. Haddad-Adel recently called on principlists— as conservative members of parliament call themselves— to avoid giving reformists an opening to split the conservative vote. Among the principlists, the speaker said, he, Velayati or Qalibaf should be the candidate. But agreeing on one conservative candidate may be a pipe-dream, especially since the other two parties to this understanding have not yet confirmed it. Iran’s conservatives come in many shades. About 25 percent of the members of parliament belong to a faction that owes allegiance to Ayatollah Mohammad Taqi Mesbah-Yazdi, an ultra-conservative cleric. During the parliamentary elections last year, the principlists failed to agree on a single slate of candidates, despite much fanfare and repeated efforts. Personal ambitions may also produce more than one conservative candidate. Yet the current political environment gives conservatives the best shot at the next presidency since they effectively control the key levers of power. They are dominant in the Majles, the security services, the Revolutionary Guards and the Basij paramilitary forces. The 12-man Council of Guardians, which rules on the qualifications of candidates, is overwhelmingly conservative. And they are the majority in the network of Khamenei-appointed clerics who serve as Friday prayer leaders and in other posts. Conservatives have the means to mobilize vast numbers of voters who rely on the regime for employment and largesse. The Supreme Leader’s sympathies also lie with the conservatives, even though his position technically calls for him to broker among Iran’s diverse political factions. Read his chapter on the Six Presidents in "The Iran Primer."